If you like Thomas Kinkade’s art work and the beauty of the Smoky Mountains, you’re going to love this place. We have four acres of beautiful gardens and hundreds of gorgeous, tropical birds. 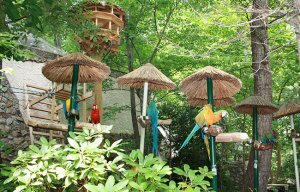 We are the largest eco-tourist bird park in the Southeast. We have unique parrot cottages, each with a different type of roof. Enter the secret garden to see the breathtaking birds in flight. You will enjoy our beautiful gardens as much as the birds do! You may even feed some of the birds by hand and have your picture taken with them! Look at all the different species up close and personally. At Parrot Mountain there’s even a waterfall! Be sure to visit the baby bird nursery, where you can pet the babies and see them at different stages of development. You can even purchase a bird to take home with you! Our trained staff will teach you how to care for your new bird. After you’ve made your way through our beautiful gardens, relax on our deck with some lunch.